When Battlestar Galactica ended, it left fans wanting more. The producers' first attempt at a prequel series airing on Syfy, Caprica, was set during the early days before the Cylon Wars. Suffering from a distinct lack of Cylons, the ratings dropped and ended up getting canceled. 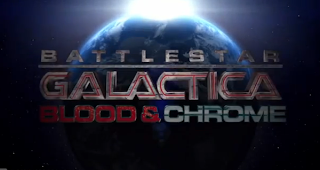 Now a new series is set to air, Battlestar Galactica: Blood and Chrome, this time centered around a young William Adama during the First Cylon War. The most surprising part is that the 10-episode series will be online exclusively at Machinima Prime. Here's the trailer. Will you be watching Blood and Chrome? Interesting idea. It looks great, and I'm sure I'll check it out since it's a series close to my heart, but.. I lost a bit of interest in the final two seasons of Battlestar Galactica and had no interest in Caprica. So still not sure. Hell to the yeah I am watching Blood and Chrome. It looks epic!